Success at last, my own homemade glitter bottles!! With tired eyes & brain, dry hands and cracking knuckles. I have successfully made 2 nicely functioning little glitter bottles. One has multi-color "pop tart" glitter and the other is sparsely populated square mirror glitter. It's all quite exciting. Not as nice as Kirk's, but I did it, the once seemingly impossible!! Just had to share. Thanks guys! And analoghaze, I am flattered you'd suggest marketing these. Unfortunately, I can't find the stands anymore (discontinued, got them for about $2 each lol). Also lava lite would probably send me threats, obviously using their little bottles haha. Maybe someday I can find the right stand/bottle combo and get really great at making the bottles. Already got a capper coming. And for multi-color glitter, I am falling in love with a mylar (? )-based glitter that comes in random multi-sized "chips". 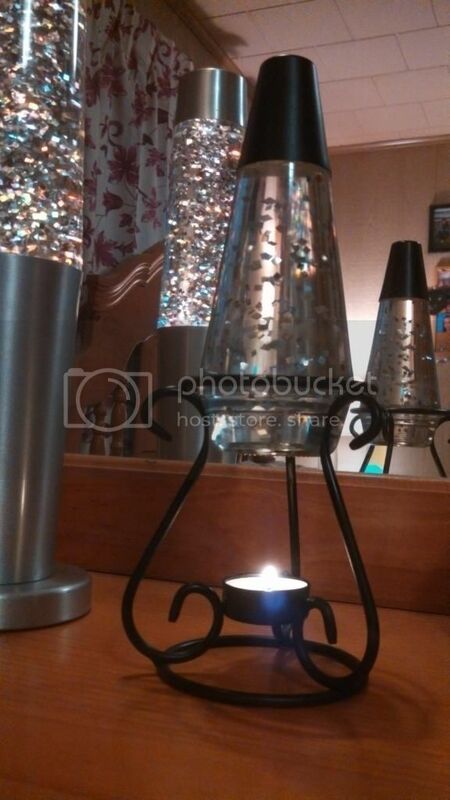 This holographic type "tinsel glitter" seems to collect the candle & room light much nicer than the micro hexagon stuff did. As for mirror type, I'm experimenting with scrunching up mylar to make a crinkled effect. 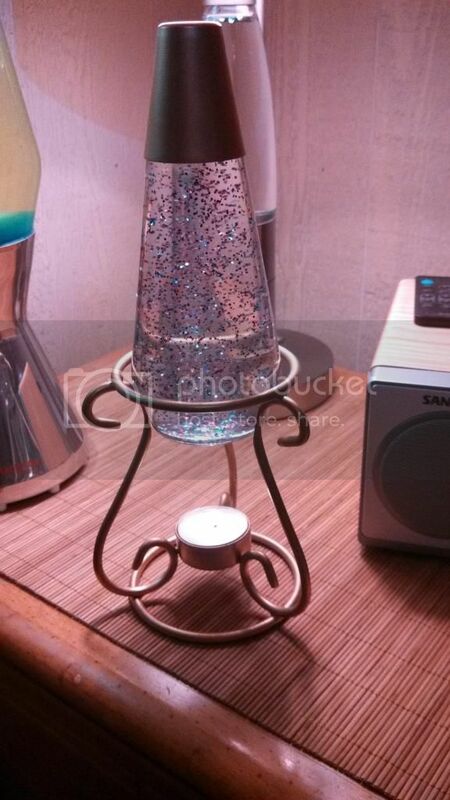 Even going to make a lamp out of a crumpled & snipped up 3 musketeers candy bar wrapper (cleaned first of course). After all that, it'll be time to order some silver or gold leaf and try flaking that off into some solution for a "Florence Art" effect. I'm just having fun. So here's a pic of the latest multi-color glitter I'm using. My tastes are leaning to the sparce...I feel crowded cuts the visibility of depth of the bottle. Like a bad snowstorm. Notice the un-uniform sizes & shapes and how the colors pop better than the micro-hexagon shaped pieces do in the pic above. 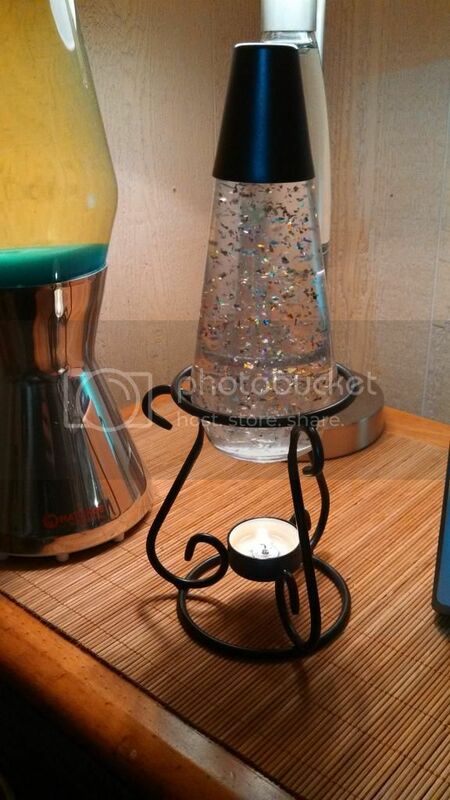 Beautiful candle lamp, love this stuff! Unlike anything I've ever seen used, holds up perfectly to the solution. Unplugged funky. Got some silver leaf on it's way! !